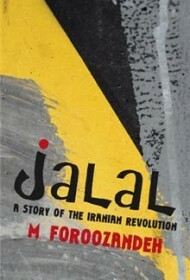 M. Foroozandeh’s novella is narrated from the perspective of an engineer who becomes involved with an Iranian court of justice during the Iranian Revolution. The engineer – we never know his name — is drafted by a prosecutor to interrogate suspects charged with crimes against the harsh new Islamic regime, ranging from drinking alcohol and soliciting prostitutes to importing arms from Iraq. During his stint, the engineer witnesses botched and brutal executions and the incompetence of court officials. He also learns that informers and those who mete out punishments sometimes use their power to pursue petty vengeance. Despite this awareness, the engineer appears to be morally disengaged and, other than enacting some clerical improvements, does nothing to effect change. He only leaves his position when the war with Iraq calls him away, at which time he transports supplies to the front and retrieves the wounded and dead. He meets his future wife while they are both burying casualties: she, family members; he, a fallen soldier. The story concludes after the Iran/Iraq war with the engineer meeting with the Jalal of the title, who is a former leader of the court, and Fakher, one of the informers. All three men have become cynical of the revolution they once supported and have served prison time for being vocal about their feelings. Foroozandeh has created a story with promise. As it stands, however, the story’s short vehicle (a mere 42 pages) cannot bear its weight. Many characters are underdeveloped; in particular, readers know little of Jalal, except for the bare facts of his work and existence. Scenes that should be finely crafted, such as the grave-digging incident, are given only the briefest of sketches. Even with the important moral issues it raises, Jalal is the mere skeleton of a novel, unlikely to satisfy most readers. One hopes the author will consider a careful reworking, which could turn the story into a work with enduring appeal.